The loose fitting Gorkas are a commonly used by Russia's more elite fighting units. These are not made for the parade grounds, but developed to be purely practical. 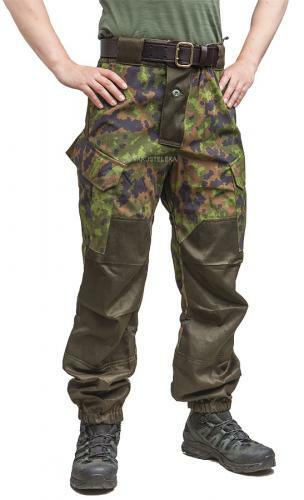 This camouflaged version is almost about the perfect field uniform one can think of. These are the trousers. Button fly and a drawcord inside the waist. Snow lock technology in the leg ends. Simple but clever, you wear the inside leg in the boot, and outside leg outside the boot. 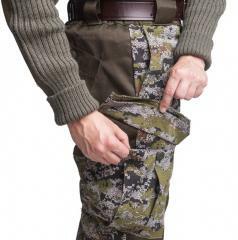 Two large cargo pockets, two back pockets and two slash pockets on the sides. Loops for Russian or US M-1950 style suspenders, which are unfortunately not included. All hard wearing areas are reinforced with a strong polycotton blend, curiously olive drab in colour. First the traditional Russian size, then the same converted to centimetres - user's recommended height and waist circumference in centimetres. Especially the length sizes are pretty generous, don't sweat it if you're a few cm off to some direction. Our model is size 175 / 95 cm and wears size 48-4 (176 / 96 cm).